The Irish National Caucus (INC) is the Irish lobby on Capitol Hill, Washington, D.C. It is a human rights organization dedicated to getting the United States to stand up for justice and peace in Ireland. The Irish National Caucus is nonviolent, nonpartisan and nonsectarian. It has no foreign principal and does support , morally or financially, any group or party in any part of Ireland. It does not send money to Ireland. All its funds are raised and spent in the United States. 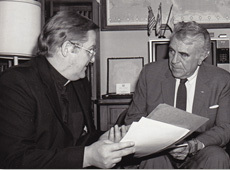 The Irish National Caucus was the first Irish organization in history to open and maintain headquarters on Capitol Hill to lobby for justice and peace in Ireland. That fact alone tells you a lot about the vision and purpose of the Irish National Caucus – not to mention its determination and ability. 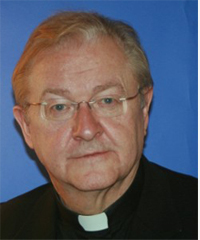 Fr.Sean Mc Manus,founder-president of the Capitol Hill-based Irish National Caucus — and the Holy Land Principles, Inc.— was born in 1944 in County Fermanagh , one of the Six Counties in Northern Ireland—in a parish,significantly,divided by the British imposed Border. In 1972, Church and State exiled him to the U.S. because he refused to be silent about injustice in Northern Ireland. In 1974, he founded the Irish National Caucus:“Thus Mc Manus became Britain’s nemesis in America,the driving force that would eventually erode Britain’s influence with in the U.S. Government.” (American Policy and Northern Ireland. Professor Joseph E.Thompson). Fr. Mc Manus has an unequaled and unprecedented record of working on Capitol Hill on the Irish issue. He has built-up huge good will for the Irish cause, and is highly respected for the non-partisan way he has pursued his mission. He has based his mission solidly on the teaching of the Catholic Church: “Action on behalf of Justice is] a constitutive dimension of the preaching of the Gospel.”(Justice in the World.1972). In 2011 Fr. Mc Manus was chosen to serve on the World Peace Awarding Council (WPPAC). The South Korea-based Council consists of twelve international and interfaith members. In 2013, Fr. Mc Manus was selected to be the Chief Judge of WPPAC. To further promote the Holy Land Principles, Fr. Mc Manus has brought out a new edition of his Memoirs: My American Struggle for Justice in Northern Ireland…and The Holy Land. In the book, which now has 400 pages, he draws a close parallel between how the British Government partitioned both Ireland and Palestine. 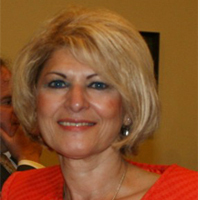 The prime promoter of the book is Barbara Flaherty, Executive Vice President of both the INC and the Holy Land Principles, Inc. The book is available on the INC Website: Irishnationalcaucus.org, HolylandPrinciples.org and Amazon.com. Barbara Flaherty, a teacher and educator, has also spent many years working in the non-profit sector. She has a Bachelor of Science Degree in Secondary Education from The University of Maryland, College Park, and holds a Master of Science Degree in Secondary Education from Western Maryland College, graduating with a 4.0 average. Barbara has spent two decades teaching history in the Prince George’s County, Maryland system. She said, “I love teaching, and I have worked with the best trained educators in the country.” In 2005, she received the Outstanding Educator Award. Her late husband, Martin, a Galway native, first introduced her to the Irish cause at the age of 18, and since then she has been continually involved. Barbara also serves as the prime promoter of Fr. 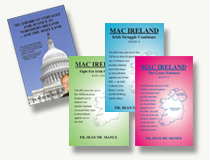 Mc Manus’s Memoirs, My American Struggle for Justice in Northern Ireland … The Holy Land, and his novels, Mac Ireland: Fight For Irish Freedom, Mac Ireland: Irish Struggle Continues and Mac Ireland: The Cause Endures. On October 24, 2013, in Seoul, South Korea, Barbara was presented with the World Peace Prize by the World Peace Prize Awarding Council (WPPAC) and was sworn in as Roving Ambassador for Peace.” Additionally, she has been appointed as a Judge and Corporate Manager for WPPAC.